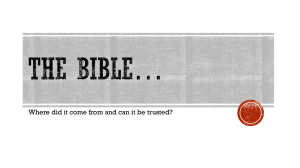 A biblical manuscript is any handwritten copy of a portion of the text of the Bible. The word Bible comes from the Greek biblia (books); manuscript comes from Latin manu (hand) and scriptum (written). The original manuscript (the original parchment the author physically wrote on) is called the ""autographa."" Biblical manuscripts vary in size from tiny scrolls containing individual verses of the Jewish scriptures (see Tefillin) to huge polyglot codices (multi-lingual books) containing both the Hebrew Bible (Tanakh) and the New Testament, as well as extracanonical works.The study of biblical manuscripts is important because handwritten copies of books can contain errors. The science of textual criticism attempts to reconstruct the original text of books, especially those published prior to the invention of the printing press.